Seattle Central College is a higher education institution, not a high school. However, we have some outstanding opportunities for students who have not yet completed secondary education. Students in our High School Completion Plus program can skip one or two years of high school and start their college/university studies right away. 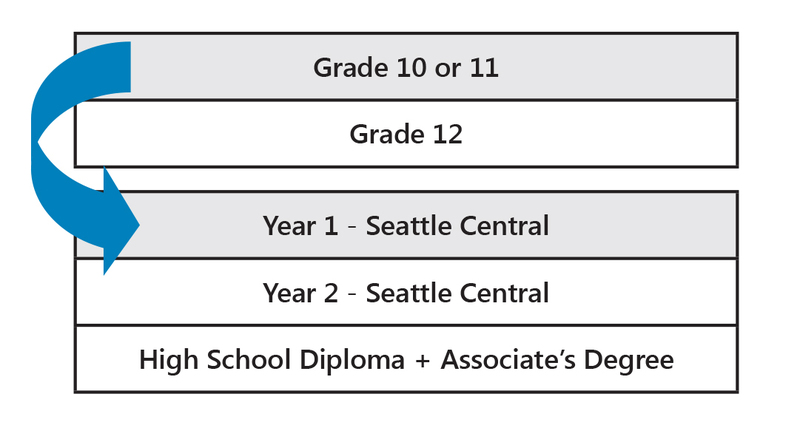 Students take full-time classes at Seattle Central College, and earn college/university credit while completing requirements for a Washington State high school diploma at the same time. By choosing this option, students earn both their high school diploma and Associate Transfer Degree in two years. Note: Students earning professional and technical degrees (Associate of Applied Science - A.A.S.) are not eligible to earn a high school diploma via our High School Completion Plus program. Enrollment in the High School Completion Plus program also includes access to personal counseling, academic and career planning, social activities, leadership training, student clubs, outstanding athletic facilities, the college library, computer and science laboratories, and much more. After successfully completing their Associate Transfer degree and high school diploma requirements, students can transfer to a four-year institution and complete a Bachelor's degree by taking two more years of study in their major. The courses students take are college courses, not high school courses (some English and Math classes may be an exception, depending on assessment and placement). Students complete the normal Associate Transfer degree requirements, which include 10 credits (2 one-quarter classes) in U.S. and Washington State History. These college courses are generally transferable to a four-year institution and can be part of a student's Bachelor's degree. The high school diploma may be used as proof of high school graduation anywhere in the United States. How will I get my high school diploma? Upon completion of the specific course requirements needed to fulfill Associate Transfer degree and high school graduation requirements, students receive an official diploma from Washington State, awarded by Seattle Central College, at the same time they receive their Associate Transfer degree. Both high school and college graduation status will be noted on the student transcript. How does getting a high school diploma through the High School Completion Plus program compare to obtaining a GED? There are many differences between a high school diploma and General Educational Development (GED). For complete details, review our Frequently Asked Questions handout. Can High School Completion Plus students transfer just like other College Transfer students? Like College Transfer students, High School Completion Plus students can transfer to four-year colleges and universities to earn a bachelor’s degree. Some U.S. universities, like the University of Washington, consider High School Completion Plus students to be transfer students, while others require students who earn a high school diploma just before transferring to apply as freshmen. This usually means your credits will still transfer, but requirements for admission, deadlines, and the level of competitiveness for freshman applicants may be different from those of transfer applicants. See our webpage for Current Students for more information about how earning a high school diploma at Seattle Central College can affect your transfer process.